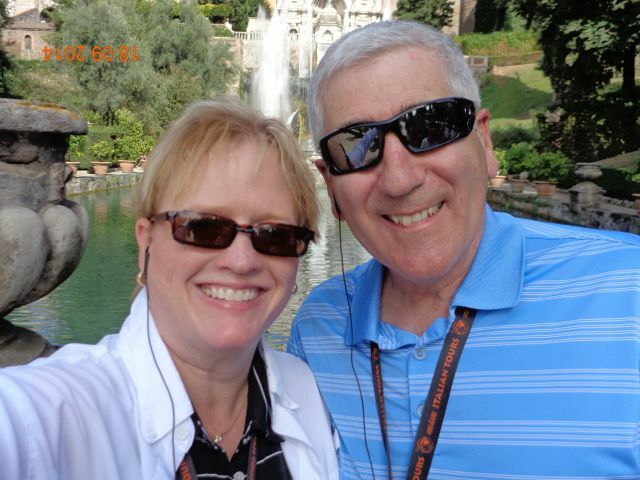 Today was the whirlwind tour of Pompeii and Vesuvius. 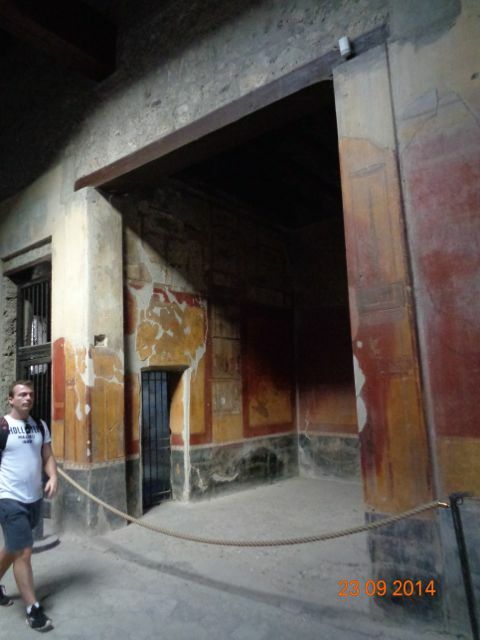 I’ve wanted to visit Pompeii since I was a kid, so I was excited about this tour. 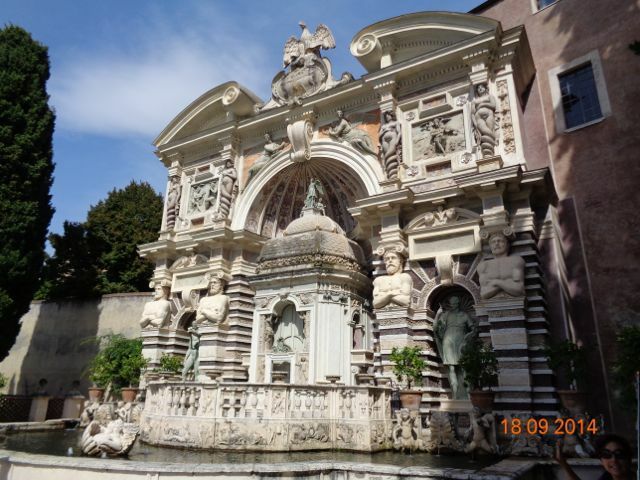 Unfortunately, it was a little disappointing because I didn’t know that most of the relics and elaborate wall frescoes found in the homes and public buildings were moved to a museum in Naples. 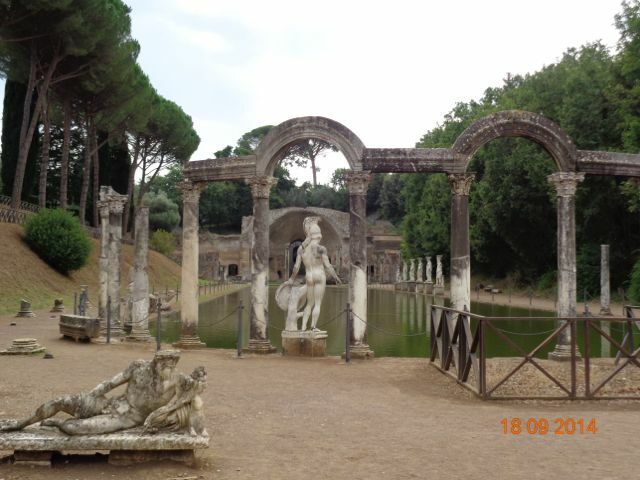 I wish the museum had been near the Pompeii site so we could have visited both. 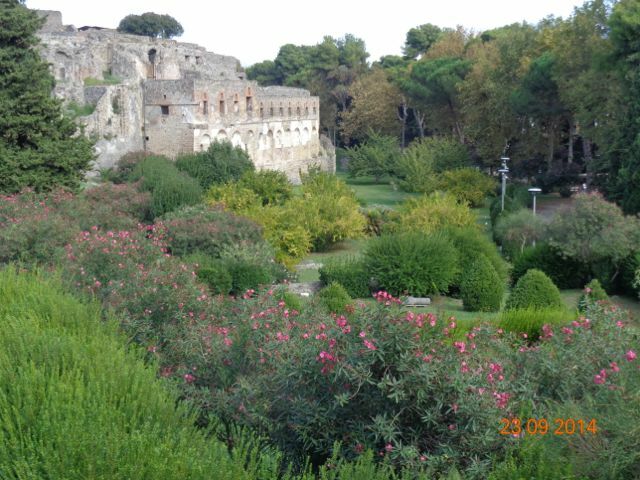 So, a word of advice, if you’re interested in visiting Pompeii, plan some time in Naples to visit the museum, too. 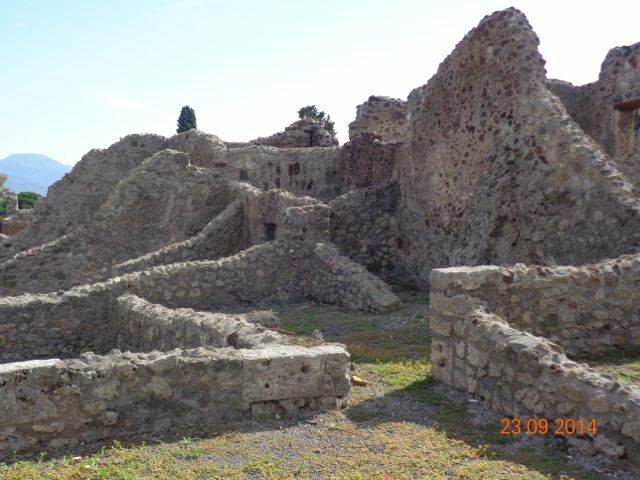 Pompeii was a port city of about 18,000 people when Vesuvius erupted in 79 A.D. Many people escaped the city when the mountain started erupting, but not all. Most of those who died were asphyxiated by the gasses from the volcano. Many people were overcome in their homes or on the street trying to escape. When they died, they were quickly covered by falling ash (about 14 feet of the stuff fell in a matter of hours, with much more to come). Over time, their bodies deteriorated naturally, but the original space they occupied was preserved by the ash. 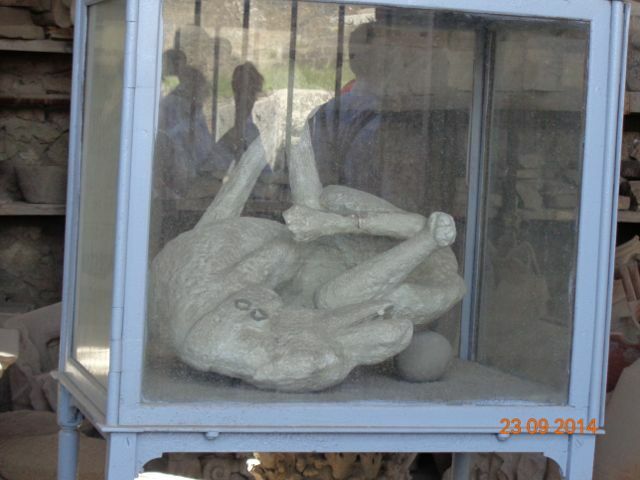 Archeologists poured plaster into these holes and made casts of each person’s original shape. Some are quite moving and I have several pictures below. 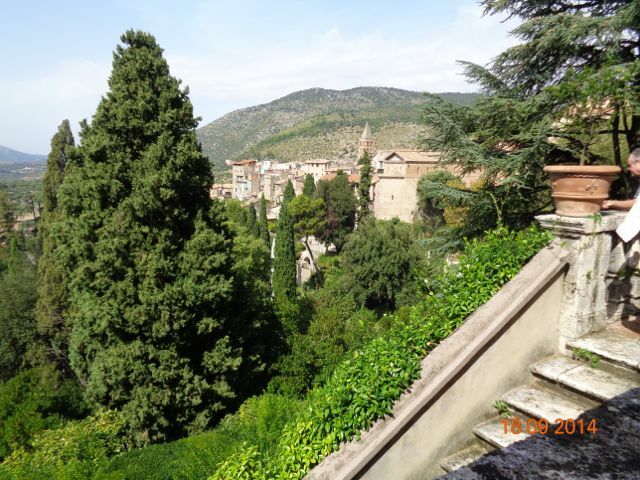 As for the city itself today, there are parts that are very well preserved, especially the wall frescoes and the floor decorations. Most of the buildings are just walls with no roof, but many, many clues exist to tell us quite a bit about the lives of the people who lived here. 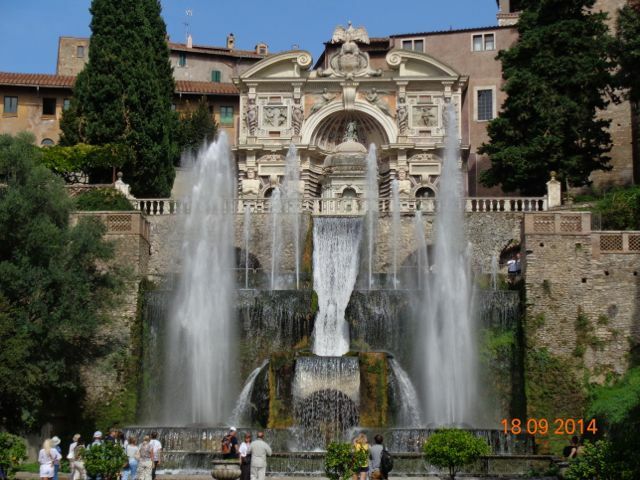 For example, there were 13 different laundries and there were over 100 fast food restaurants. 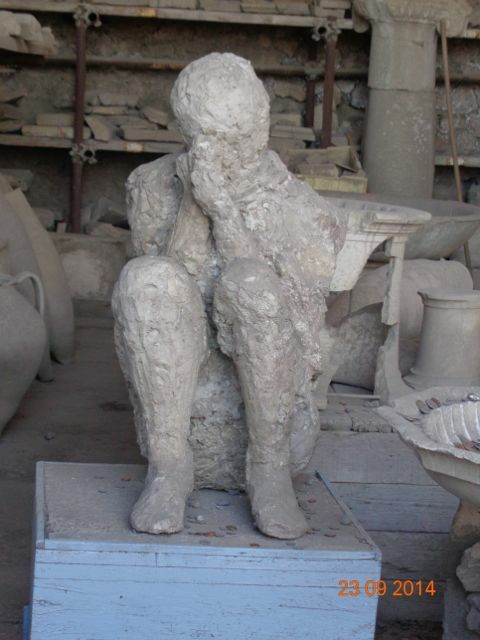 Apparently, Pompeii was a big “take away” city. This was probably because of all the soldiers in port and the fact that many of the poorer homes didn’t have kitchen facilities. There are also signs supporting candidates for the upcoming election and, my favorite, the “Cave Canem” sign: Beware of Dog. As for Vesuvius, its a volcano. 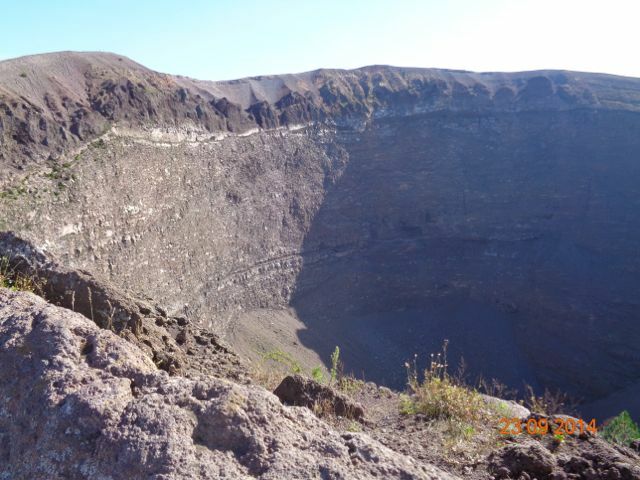 We’ve seen several over the years, and while they sound really interesting, the crater of a volcano is pretty boring. 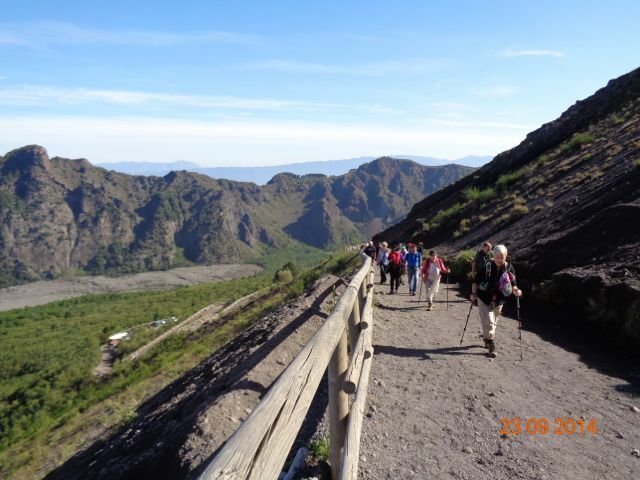 However, climbing to the top was quite an adventure and the views were spectacular. I’m pretty sure the entrance to the trail was run by the mafia. Take a look at the pictures below and I’ll tell you the story. 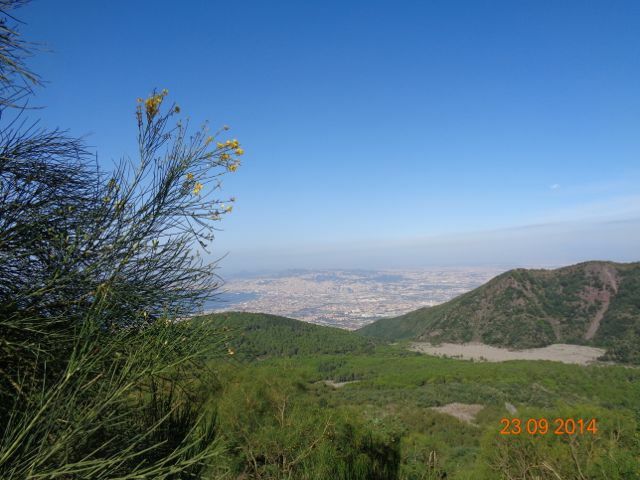 This is a view of Naples from the beginning of the trail leading to the top of Vesuvius. 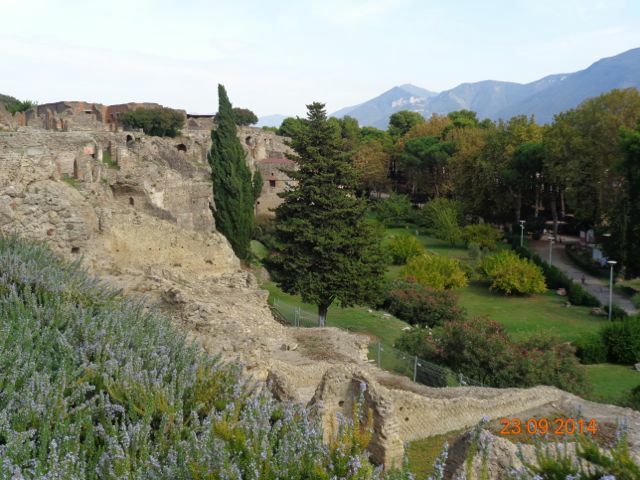 The mountain has erupted many times and was actually 3 times taller in 79 A.D. when the eruption that ended Pompeii happened. It is an unpredictable volcano because sometimes when it erupts, it is mostly ash, like when Pompeii was destroyed. Other times, it spews lava. No one knows what to expect. 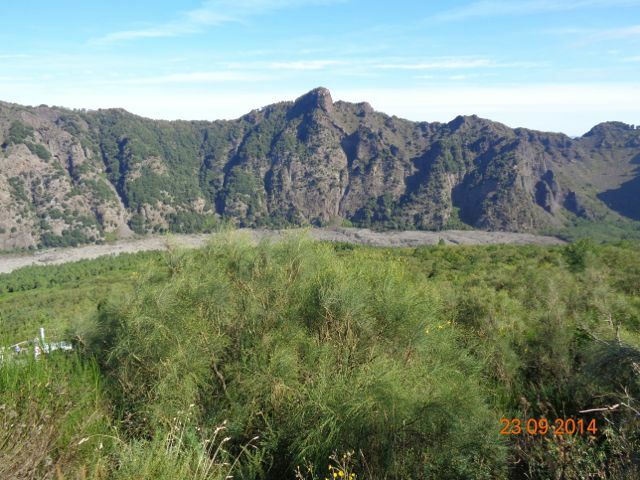 In the picture above, you can see that trail to the top is actually inside the crater of an older eruption. The jagged peaks in the distance are really the craggy rim of the crater. The part that looks like a landing strip at the foot of those crags is an old lava flow. The trail up was probably about ¾ a mile, but it was very steep. I needed many stops to catch my breath. 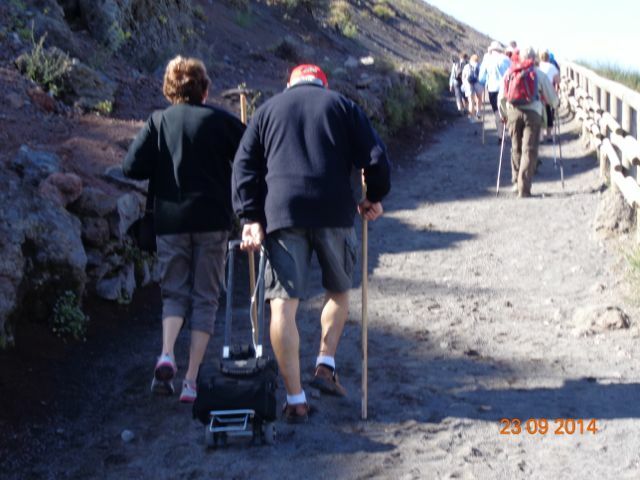 I had to admire the couple above who braved the climb with their portable oxygen. See what I mean? 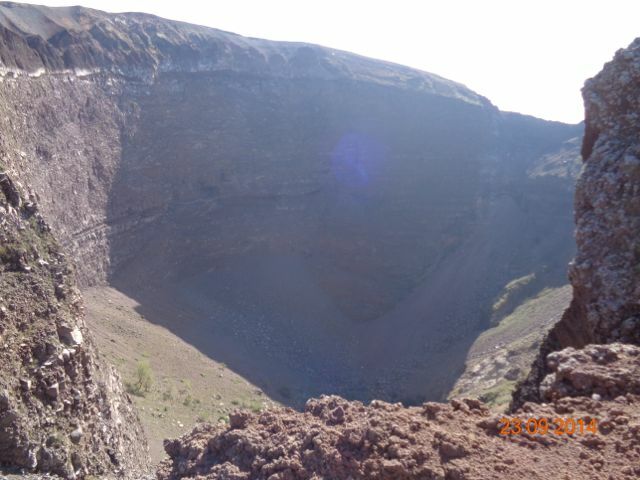 The crater of a volcano is surprisingly boring. Little to no vegetation, no interesting colors, not usually any interesting shape. Kinda boring. In this case, the sheer cliff walls were a little interesting. Unfortunately, it was so windy at the top, it was hard to even stand. Okay, here’s the ticket booth. It’s a terrible picture, but I didn’t want to draw attention to myself. 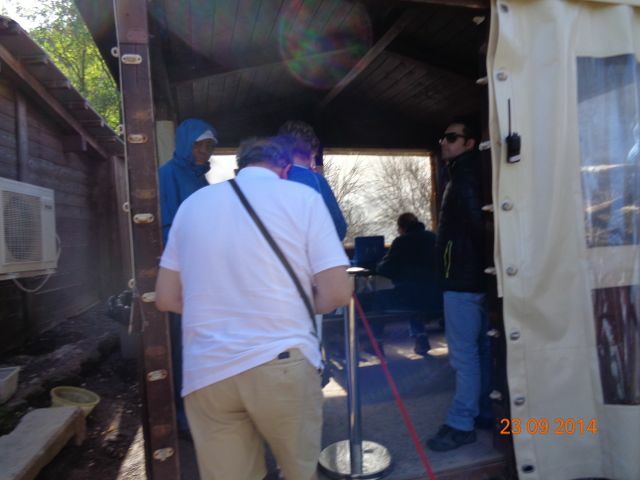 The entrance to the trail to the top was blocked and all traffic was diverted through this little shack. Inside was a guy in really nice clothes sitting at a picnic table. In front of him were large stacks of Euros just piled on the table. He didn’t have a cash register and there were no receipts or tickets. Beside him were two really big, middle-aged, enforcer types who never said a word and looked sullen and intimidating. It was like these guys threw up some flimsy barricades and just took over the trail entrance and demanded payment. We asked the tour guide about it later and she said we were right, it is mafia run, but at least they have a “license” from the government to do so. However, the license doesn’t require them to pay any of the proceeds back to the government and it doesn’t require them to improve the property in any way. It’s 100% profit. Hmmm . . . 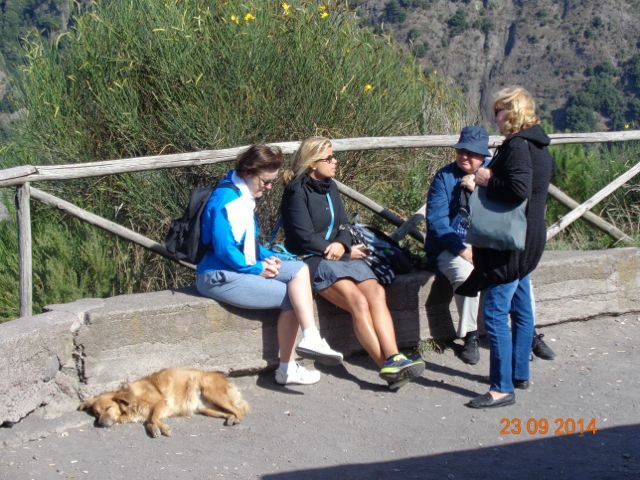 I included this picture because we’ve seen a few stray cats and dogs everywhere we’ve visited. This guy was enjoying a good nap. I asked Aldo about it yesterday and he said the strays are looked after by everyone and treated with affection. I have to say, they all looked pretty healthy and happy to me. Here’s another picture I included to remind me of something. 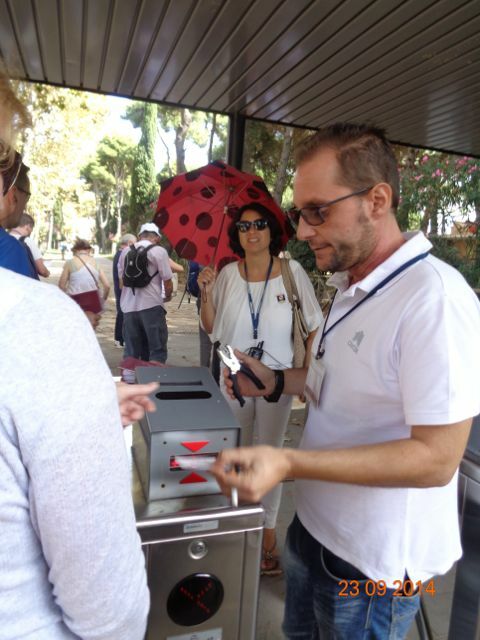 Here, the ticket taker is smoking a cigarette while he does his job. 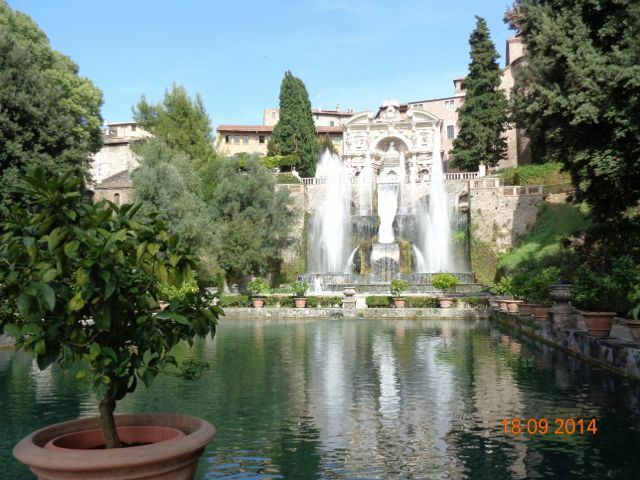 As a rule, there are smokers all over Italy, especially among the young people. 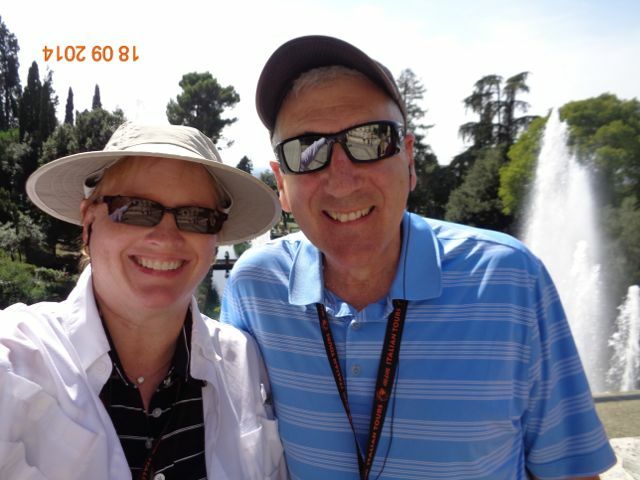 It was almost impossible to avoid the smoke walking the streets of Rome. Also, in keeping with the Italian’s attitude toward rules, people completely ignored the no smoking signs in the train station in Rome. 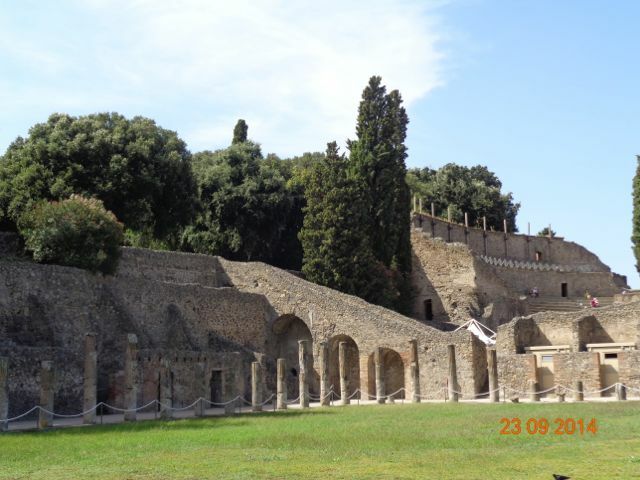 Okay, now we’re in Pompeii. 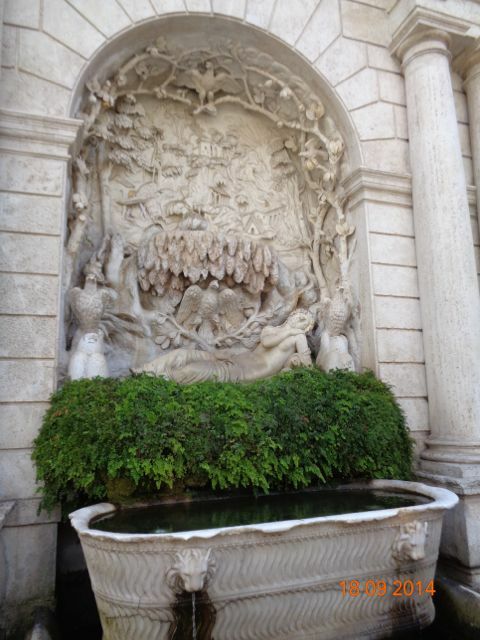 This is a public courtyard that served as the main entrance to two theaters, one bigger and one smaller. 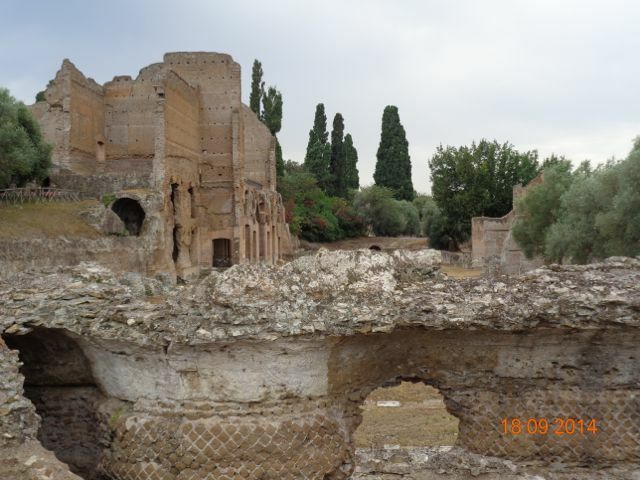 About 20 years before Vesuvius erupted there was an earthquake that damaged the place where the gladiators lived, so they moved here. 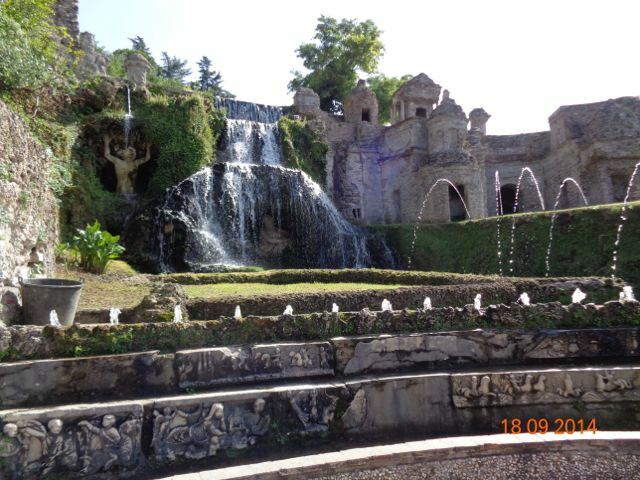 This is where they lived and practiced their art. Archeologists found lots of their paraphernalia during the excavations. These are the two theaters behind the courtyard. 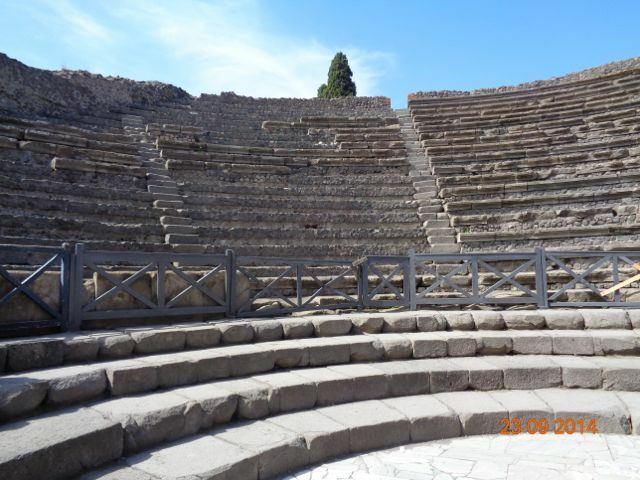 The larger one has been updated and seats about 6000 people. 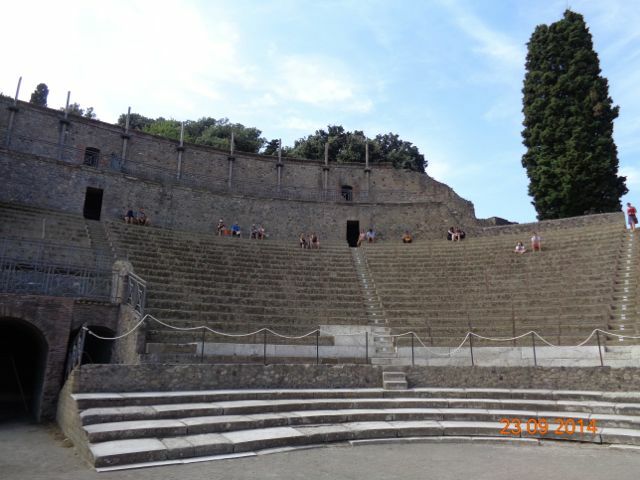 It’s still used for performances today and is scheduled for a run of Mama Mia in a couple of weeks. I would love to see that! 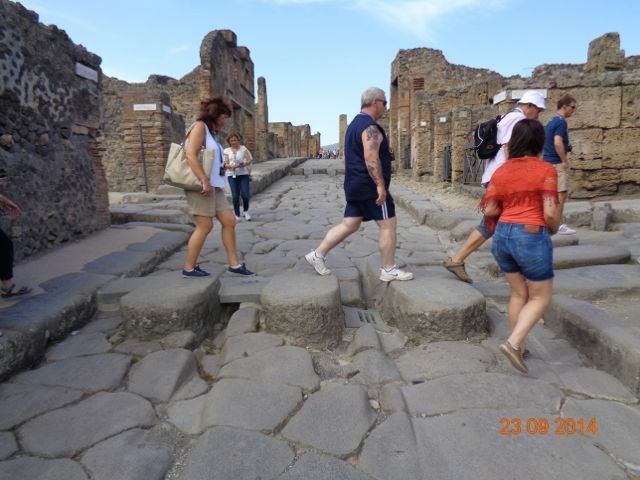 The streets of Pompeii all run downhill because the city got lots of rainfall. This design allowed them to drain. 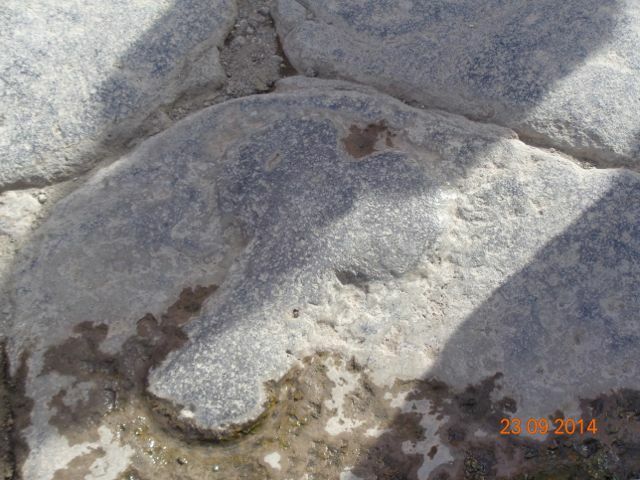 The larger stones across the road allowed people to cross when they were flooded and they acted as speed bumps. You can see the groves made by the chariot wheels between the stones. 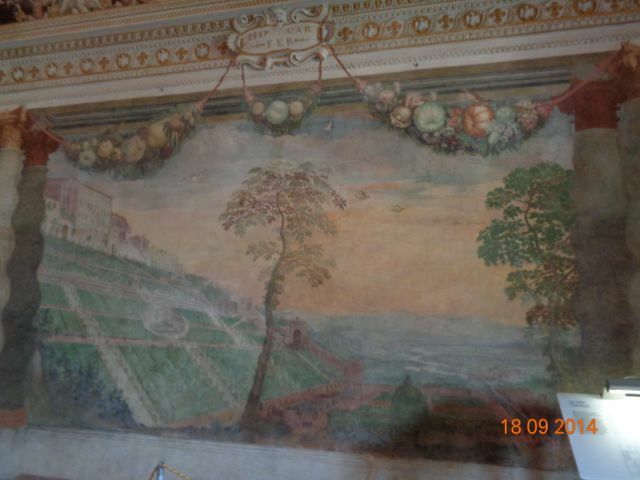 This is one of the frescoes in the entrance to the house of a very rich family. Directly behind the entrance room is the courtyard below. 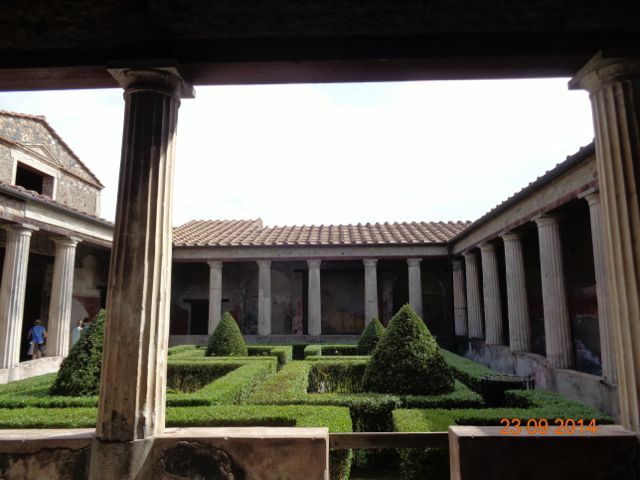 All around this courtyard is the colonnade and behind the columns are the rooms the family lived in. These include bedrooms and a dining room. This is the room in the back corner. It still has quite a bit of color on the walls. 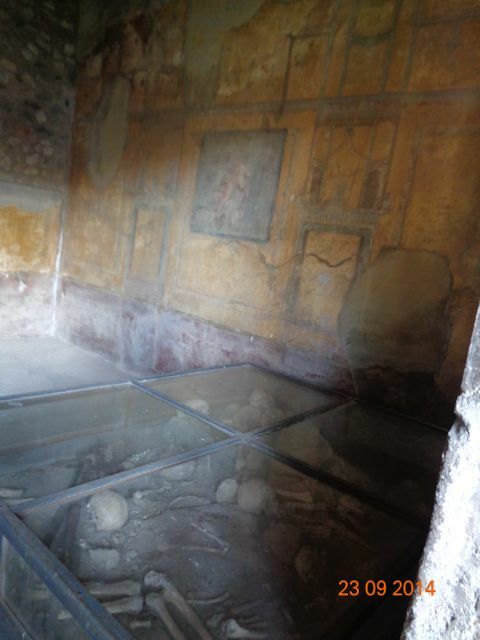 Also, several people were found in this room and their bones have been preserved here. This isn’t what you might think. It’s a 2000 year-old McDonalds. 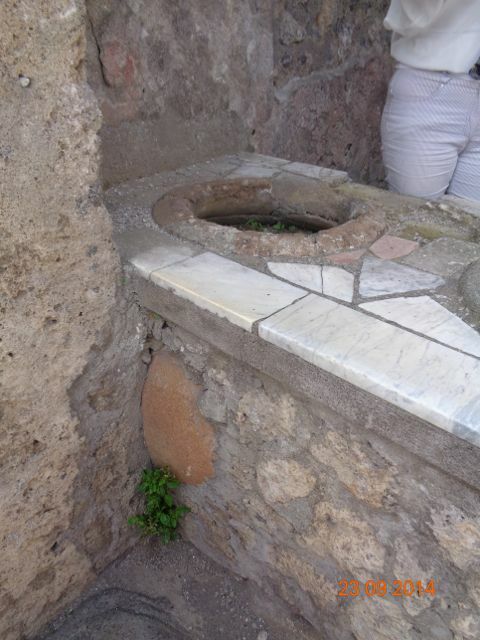 The rims are the tops of amphoras (you can see the side of one in the break in the wall in the second picture). 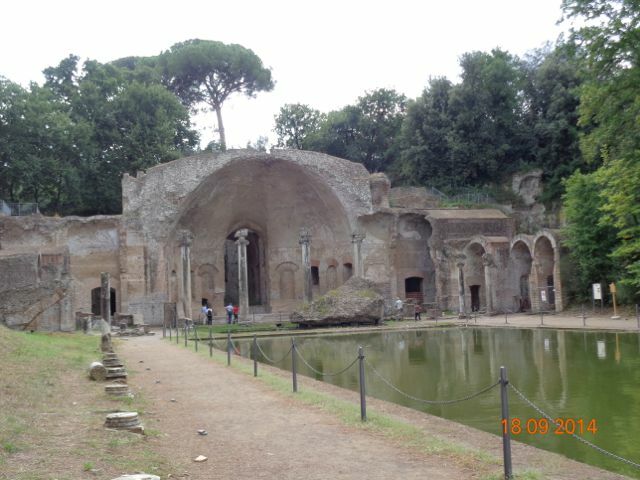 The amphoras were filled with water and a fire was lit under them. A bowl was placed inside the rim and the food was placed in the bowl where it cooked over the hot water. 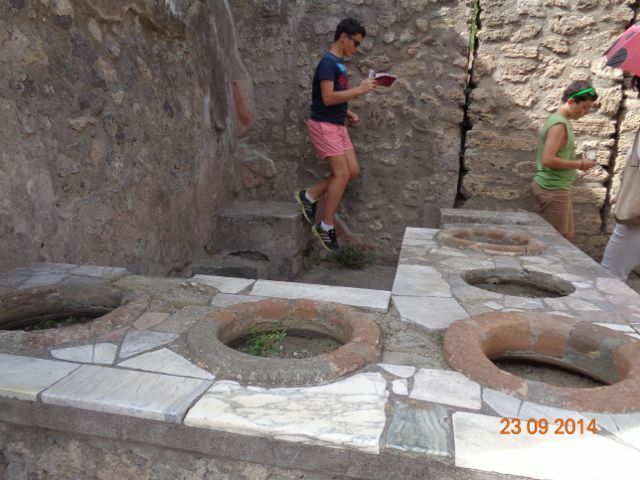 As I said above, there were many of these fast food places in Pompeii. 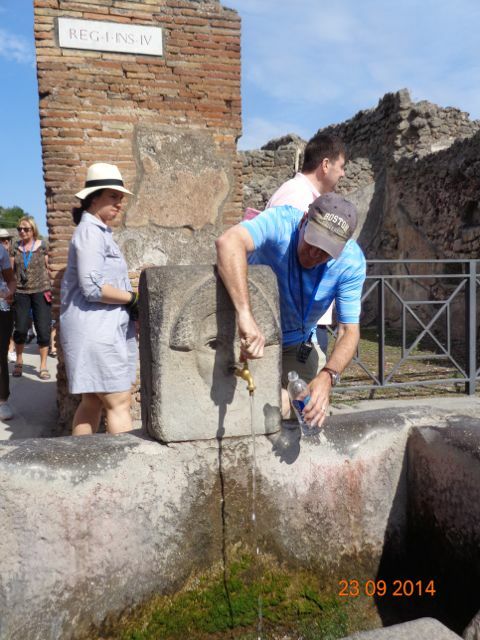 In Rome, and other places, like here in Pompeii, there are public fountains with drinking water. 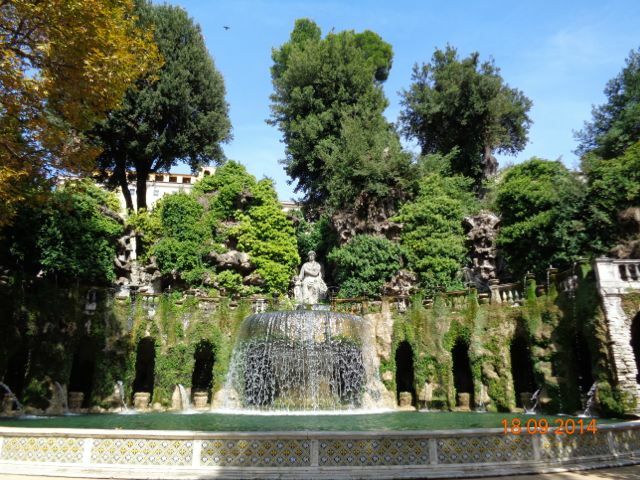 When I first heard that the water fountains of Rome contained drinkable water, I thought they must be nuts. 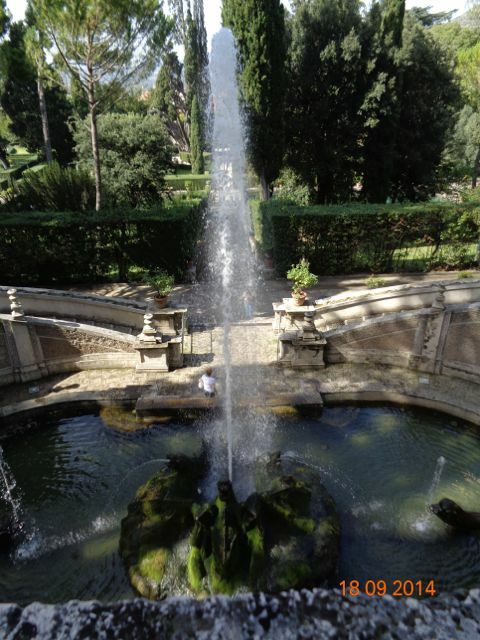 But they weren’t talking about the decorative fountains. 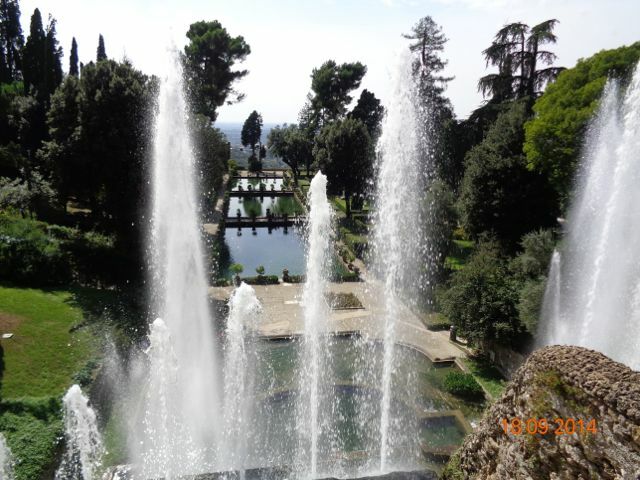 They were talking about the fountains that look something like the one above. 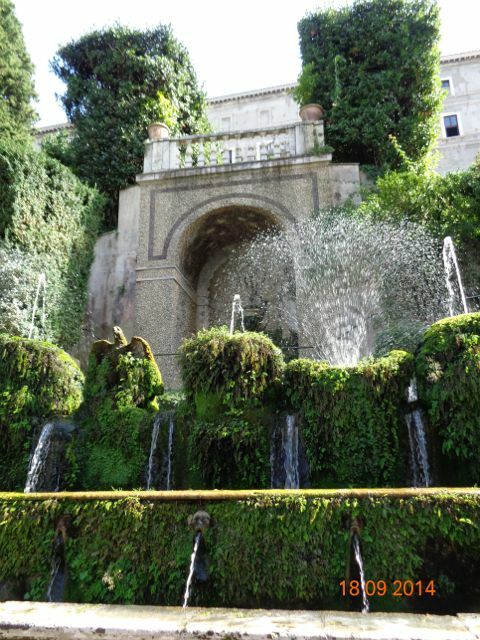 In Rome, there were no spigots, they ran freely because they were often natural springs. Also, the water was ice cold. 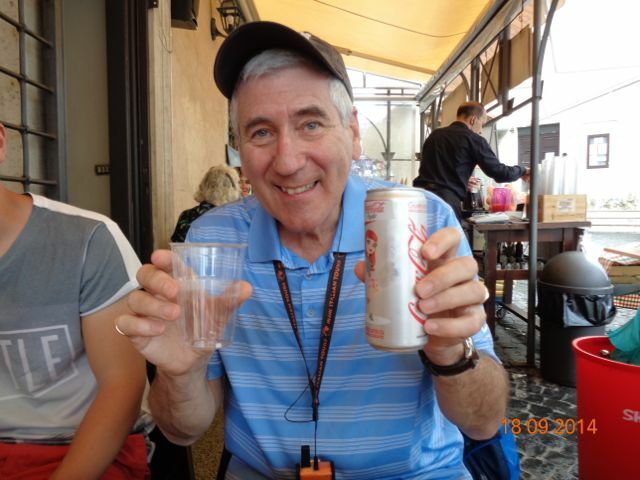 We refilled our bottles several times on the day we visited the Colosseum and that cold water was really refreshing. Above, Bob refills our bottle. 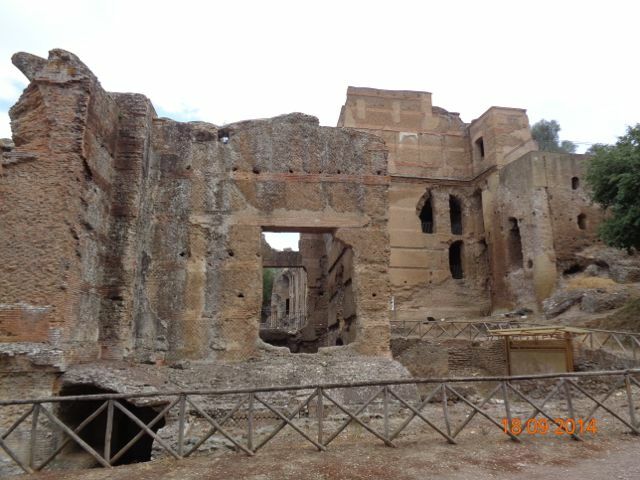 The state of many of the buildings in Pompeii is a lot like this. If you have a low threshold for the randier side of life, don’t look too closely at the pictures above. 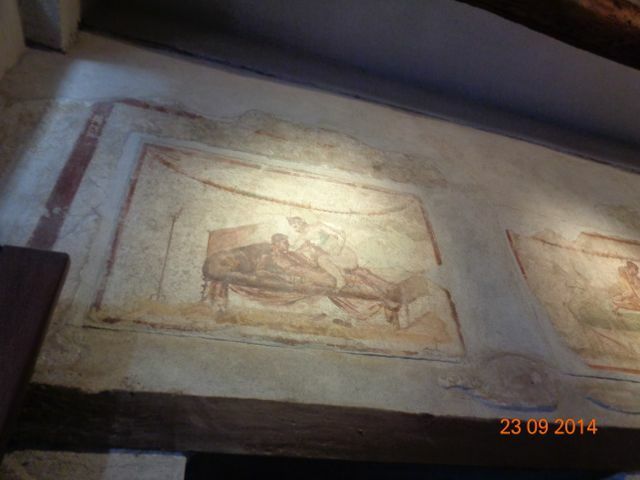 These were taken in the brothel and the frescoes were meant to be sort of a picture menu of the available services. 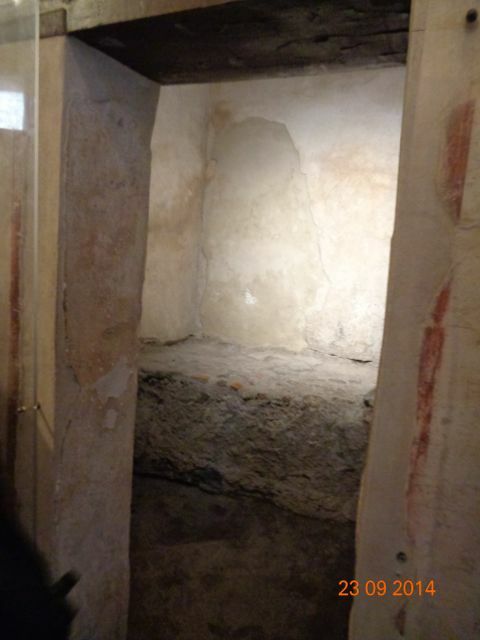 Below the frescoes were tiny little rooms with a stone “bed” in which the deals were sealed. Again, don’t look too closely if you’re easily offended! This carving was on the street and it “directed” the sailors who were walking into town from the port in the right direction for the “services” they were seeking. 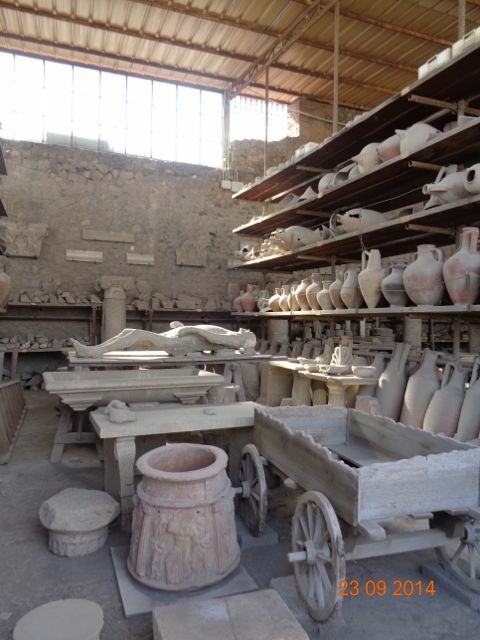 Here are some of the artifacts found in Pompeii. And now we get to the plaster casts. Above is a dog in clear agony. The dog was chained so that is mostly the reason for his position. But asphyxiation is a slow and horrifying way to die and this dog proves that. Another heartbreaking story with this young man. They believe he’s about 14 years old. He must have sat for a moment to catch his breath during his escape and he never got up again. Here’s the front of the city, the part that would have faced the sea. 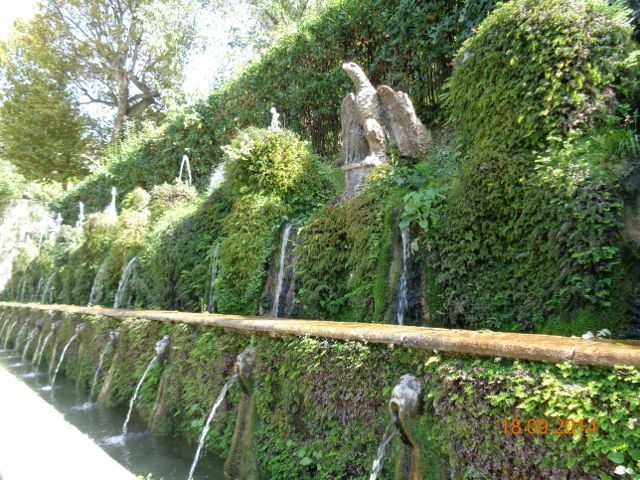 In fact, much of the vegetation in front of the wall would have been under water. Today, mostly because of earthquakes in the area, the shoreline is several miles away.